Heads are still sore! You can’t beat a long weekend to go overboard on everything that’s bad for you! So, how do you recover? Usually, we’re supplying you with a Monday morning slice of soulful house music to ease you back into normality. Today though, we’re taking the French-influenced house route, with the latest release from Toolroom Records – step forward Parisians Punky Blaster! Punky Blaster is Tony Brodski and Guillaume Delarge, France’s latest production duo that many are expecting big things from. 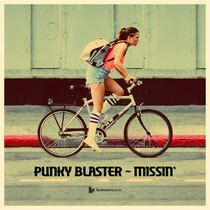 This track, ‘Missin’’, is a fusion of filtered, disco house music at its best, creating that feel-good vibe that was so evident in many tracks from years ago. Its video harks back to the good ol’ days too, the excitement of getting your first vinyl test pressing and ‘biking’ it out to loads of industry bods for feedback… and starting the hype! No sterile file sharing here! Mixes come courtesy of The Cube Guys, Rogerseventytwo and Art Of Tones. It’s out exclusively on Beatport this week (we think) with a full release next month. Check the video below.